I’m excited to announce our revolutionary new version of SteelCentral AppInternals, which is a radical re-imagining of our Application Performance Management solution. As an APM subject matter expert for Riverbed for the past 12 years, I’ve helped hundreds of customers around the world solve mission-critical application performance issues with AppInternals. I’ve watched it steadily evolve from a fledgling version 2.6 to the powerhouse that was version 9, but version 10 is a quantum leap forward. Lightweight end user experience monitoring of all transactions, all the time, without sampling. You’ll know if any of your users are unhappy, who they are, where they come from, and rapidly determine if the issue is in your application infrastructure, the network to the client, or on the client machine so you can take the appropriate course of action. Detailed tracing of all transactions through the Java & .NET tiers. This will reveal the precise reason for the end-user issues: Code, SQL, remote Web Service calls and more. Like EUE, this also captures every transaction without sampling in a lightweight manner and will not impact your application or server. Dynamically generated transaction & application maps expose issues related to specific paths transactions may take through complex architectures. These are generated on-the-fly for every unique transaction, the application as a whole, or any subset of transactions. Watch them change over time to quickly detect configuration changes, load balancing issues and new remote web service dependencies. High-definition monitoring of the OS & application infrastructure. 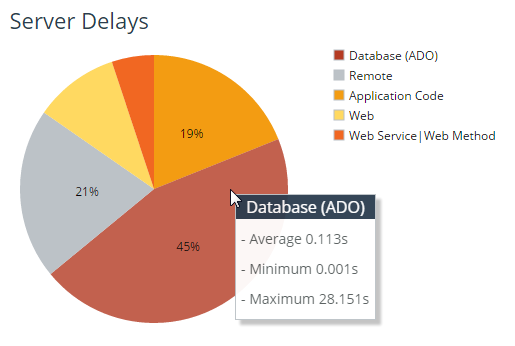 Hundreds of unique metrics are collected every second from each server enabling you to determine if delays are due to environmental factors. Other solutions capture these metrics at 15, 20 or even 60 second granularity so intermittent spikes can slip through the cracks and go unnoticed. AppInternals ensures that if something happens, even briefly, you’ll know about it. We’ve simplified the installation. You’ll have AppInternals setup and providing value in less than 15 minutes. That’s no exaggeration. I’ve done it personally without breaking a sweat. We’ve simplified the configuration & management. Our agents auto-discover the applications to be monitored and all setup is done centrally with no config files to mess with. Want to bulk configure 100 App Servers? Some on-premise and others in the cloud? No problem. Done in minutes. But most importantly, we’ve simplified the usability & workflows by creating a brand-new UI inspired by modern best practices. The moment you log on for the first time you’ll see useful information, thoughtfully organized and visualized. You’ll have the information you need at any moment at your fingertips. Simple enough for a new employee with no training to get value from in minutes, yet powerful enough for your most seasoned performance experts to solve the toughest problems quickly. Whether you’re responsible for Development, QA/Stress Testing, Staging or Production deployments SteelCentral AppInternals 10 will allow you to rapidly detect issues impacting your business, and more importantly, quickly provide actionable information to the teams who can resolve them. Want to see more? Checkout the AppInternals 10 walkthrough video. Go to www.appinternals.com and sign up for a free trial to discover how quickly you’ll be able to find and resolve performance issues in your applications.